Throughout my college years, I worked at Waldenbooks, further indulging in my love of books. While working there, I came across MANY books that caught my eye, but I was kind of a book snob and only willing to read widely accepted Classics or quirky, literary gems that weren’t likely to make the New York Times Best Seller list. Well, except for Harry Potter. He was my exception. 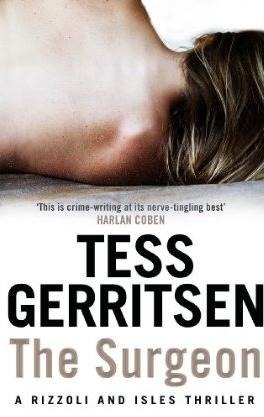 One of the authors that I kept seeing on our shelves, and in customers’ hands, was Tess Gerritsen. While working on shelving books and/or unloading shipments, I read the blurbs for some of her novels and was hooked on the publisher provided bait. They had me intrigued, but I didn’t allow myself to either borrow or purchase the book. I had an image to uphold, after all, and when you’re 18… image is everything. Fast forward to the present. I’m 27 years-old and no longer trying to impress anyone. Hell, at this point in my life, most people are impressed by the fact that I read for pleasure at all. Most people can’t find time or energy, but I’m reveling in that period of my life post-college and pre-kids, I guess. I’m really taking advantage of having “ME” time. So, with this in mind, I read whatever the hell tickles my fancy. And guess what? Tess Gerritsen tickles my fancy. Honestly, I was reminded of her novels thanks to the local bus-side advertisements for the Rizzoli & Isles series on TNT. These ads paired with a recent radio interview with Gerritsen really got me jazzed to find the books again. Knowing that I wanted to try out here series first (see how much I’ve grown! ), I went directly to her website to gain some knowledge as to which book is supposed to be read first. Her website (http://www.tessgerritsen.com) is EXCELLENT for really spelling this out for newbies. As you can tell from the very top of this post, the first book is The Surgeon. One of the first things that struck me about this book is that Gerritsen definitely does not shy away from leaping into the thick of the disturbing. I don’t want to ruin any details about this book, but let us say that my jaw dropped and I was pleasantly surprised by the tale that unfurled on page after page… I couldn’t put the book down. I completed the story in a week and am already chomping at the bit for book #2. I must choose my series wisely, because this is another series where I absolutely love the characters, the writing style, and the subject matter. Like Larsson, Gerritsen successfully keeps a mystery alive (and one that you can’t very easily figure out on your own – the antagonist isn’t obvious) without becoming cheesy. I am curious to see where the story goes in the 2nd title (The Apprentice) and whether or not Maura Isles is introduced. I am certain that you will see many more updates on both this series and author going forward.